According to the Vedic teachings, the first and most important qualification of a teacher is that he or she is properly situated in a disciplic succession (parampara) that descends from a divine source. This means that a teacher must have a teacher, who in turn had their teacher, and so on, with the original teacher being God. In other words, perfect knowledge comes from the perfect source or God. The Vedas say that we humans cannot reach such knowledge on our own, using our fallible mind and senses. We must seek a divine connection. No one can thus claim to be presenting perfect knowledge without showing a tangible link to God through a disciplic succession. This also means that it is very important that the teacher carefully repeats exactly what he has been taught. In this way the perfect message of God is preserved. I am initiated into an unbroken line that goes back 5000 years to Lord Krishna, the speaker of the Bhagavad-gita, who I accept as the Supreme Person or God. The line descends through many spiritual masters, one of whom is His Divine Grace A.C.Bhaktivedanta Swami Prabhupada (Srila Prabhupada), who is my teacher, and who is accepted as the fully liberated soul. In my own writings and talks I therefore try to represent his teachings as best as I can. 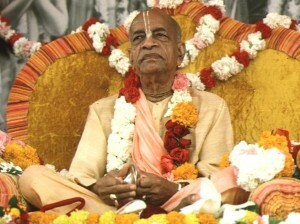 Srila Prabhupada came to the West from India in 1966 to found the International Society for Krishna Consciousness. Having virtually no money and very few possessions, he lived in almost abject poverty for one year, depending on the help of friends and struggling to adapt to the Western climate and lifestyle. Determined to share the sublime spiritual teachings of Krishna, he went to New York where he would sit alone in a park, chanting the Hare Krishna mantra. In this way he gradually began to attract some followers who found for him a small shop where he could give lectures. These lectures increased in popularity with time, and soon his followers began to establish centres throughout America, and then the rest of the world. Within twelve years Srila Prabhupada saw more than 200 centres spring up in dozens of countries. He travelled the world many times in order to visit these temples, all the time writing books, which he saw as his main mission. He translated some sixty volumes of Vedic literatures into English, giving elaborate explanations of the texts. His acclaimed works include the Bhagavad-gita, Bhagavata Purana, Chaitanya Charitamrita, and many others. Srila Prabhupada left this world in 1977 but is still revered in centres all around the world, and for his followers such as myself is still very much alive in his divine teachings.